I can’t remember what made me decide to actually play Dragon Quest, since I owned the first three games for Gameboy Color for quite a long time. When you first turn on Dragon Warrior, it seems like an everyday Square RPG. Which, in many ways it is, since it literally is a Square RPG. The first Dragon Quest game was released before the first Final Fantasy game, and I think it’s important to note this since they came from generally the same concepts and ideas. 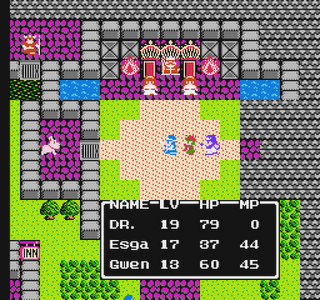 Perhaps the reason I chose to play Dragon Quest was because I thought Final Fantasy is too hard. You press start, hear the fanfares, and start a new game – I don’t remember if much of a backstory is given, but the setting is stereotypical enough for you not to need one. You start the game, walk around the castle, leave, and probably fight your first monster, a slime. But you fight it alone! Perhaps it’s just a symptom of being raised with party-style RPGs. I spent at least half an hour expecting to find some sort of ally to join my party at some village or nearby town. This never happened. I just can’t conceive of how beautiful it is, to play an RPG like this with only one character! It’s not just that you’re the descendant of Loto (Roto, Erdrick), it’s that you’re completely alone in this world! I guess I just really got into this aspect of the game because it shocked me or something, but I was just so overwhelmed by the beauty of this throughout the game. Can you imagine traversing the world completely alone on some sort of world-saving quest? Because the protagonist doesn’t speak in the game, it’s impossible to know anything about him as a character. Maybe this also contributed to why I liked this so much. This just goes back to why I feel really strongly about these older games. I think the whole atmosphere is really good for role-playing and getting lost in the game’s setting. I feel like the simple graphics of the time give the player a lot of imaginative or creative freedom while playing, as does the whole ‘silent protagonist’ cliché. The setup with one character also allows that one character to become very well-developed in terms of in-game abilities. Having one character really ties the player to the character since you only have your one character to think about. Perhaps this is also true just because there’s no opportunity for the protagonist to speak since he has no companions with which to speak. Another aspect of why perhaps these older games also make me feel more involved is because you’re really required to talk to NPCs. Seriously, if you don’t talk to NPCs in these games you will not get anywhere at all. I’m sure any experienced retro gamer would know this, but I really wasn’t familiar with this concept. Exploration is so much more important in older games than it is now. You’re not given a map, or if you are, it’s not particularly useful. There’s no fairy floating above your shoulder, no holographic projector around your neck, no simple linear path to the game. It could probably be argued that there is an obvious linear path, but I had a hard time finding it in Dragon Quest. Games like Dragon Quest were ideologically just as simple as games today – go to a dungeon, beat a boss, get new goodies. But in Dragon Quest, each part actually takes effort or at least motivation. There’s no resource you can simply call up to tell you “Duh! Go west, then north around the mountains, then south again until you see a large tower. No, it won’t be the town, and it won’t be the cave. It will be a tower. Once you’re there, I’ll tell you how to reach the boss.” No one is going to give you that much detail. I could spend days – and have – just looking for where I’m supposed to go next, or what I’m supposed to do next in Dragon Quest, DQII, and the Final Fantasy games. I wouldn’t exactly call the gameplay the best part of the game, but it’s probably the most important. The setup of battle was great mainly because it was simple and reminded me of pokemon, one-on-one style. The idea of a lonely hero worked well here just because you didn’t have to worry about protecting a mage, or giving one character more experience than another. He learned useful magic, because there was no one else to learn it for him! And even better, (I love this part!) he didn’t have to buy his spells! With Dragon Quest’s music, I do admit to hating it at first. I thought, “Wow, this music is so annoying and bad.” Then one day I decided to listen to it. And damn, was I ever surprised! The only music I didn’t really like was the battle and dungeon music. I was convinced that Unknown World, the overworld theme of DQ1 and in parts of DQ2, is the greatest gameboy song ever. 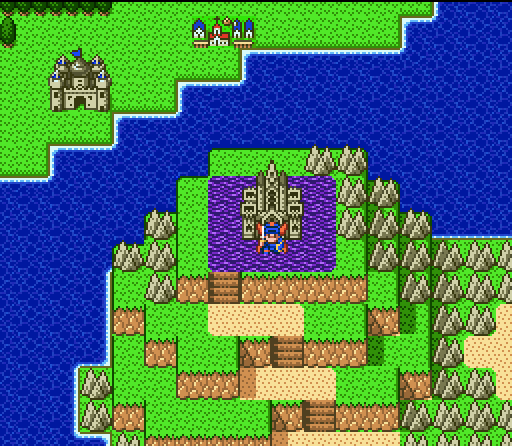 Upon playing DQ2 and hearing the song Traveling with Friends, I was immediately reminded of Super Mario Galaxy. I thought to myself, ‘How can this be so good? How can this simple song be so, so good? I was just astounded to be able to compare Dragon Quest’s music to something like Super Mario Galaxy’s music. I honestly loved (Dragon Quest composer) Koichi Sugiyama’s work in those games so much that I watched a movie whose soundtrack was composed by Sugiyama. (Sirius and the Flame Princess?) And the soundtrack was the best part of the movie. Okay, I could probably just keep going on and on, but I think I’ve covered most of everything I would have wanted to cover. In summary: Dragon Quest 1, good game. That’s not to say that I haven’t seen images of people stomping on the NES cartridges of Dragon Warrior, but it’s a game that I never thought I would enjoy until I put a few hours in and gave it the attention it deserved.